This coin contains 10 oz of gold with a purity of .9999. The obverse features the head of state of the British Commonwealth, Elizabeth II, along with the weight of the coin, its purity and face value. The reverse features a snake wrapped around a tree branch and bearing a striking scale pattern. 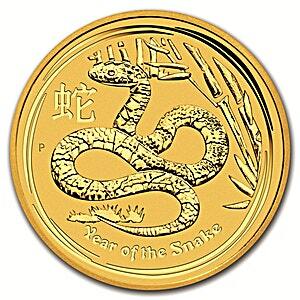 "Year of the Snake" is imprinted along the bottom of the coin. The Perth Mint’s traditional ‘P’ mintmark is also inscribed on the left of the coin. The 10 Gold Lunar is legal tender at AUD$1000.